The World’s Shortest GRE Practice Test by Gary Gruber, Ph.D.
Take the 20 questions below, reproduced with permission from test-taking guru Dr. Gary Gruber’s book The Complete GRE Guide 2014, will help you to approximate your GRE score. Once you complete the questions, click the button at the bottom of this page for answers, scoring, and hints to these questions. 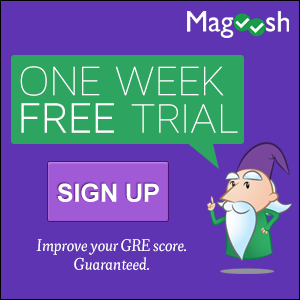 Learn Dr. Gruber’s winning GRE strategies that will help you improve your score. Although it shouldn’t take you more than 40 seconds to answer each Verbal (Reading) question and 1 minute to answer each Math question, you may take this test untimed and still get a fairly accurate prediction. Gary R. Gruber, Ph.D. is recognized as the leading authority on standardized tests and the originator of the critical thinking skills used to prepare for them. Through his work, more than 40 books with over 7 million copies sold he has dramatically increased aptitude and intelligence among all age groups. Dr. Gruber has been helping students excel on their SAT’s, and ACT’s for more than 30 years. His lifelong mission is to get the nation passionate about problem solving and to develop and hone critical thinking abilities.